Bloating is a common digestive complaint I hear in my clinic. Whilst a little bloating can be a normal part of digestion as the food is broken down and fermented by the bacteria that reside in our digestive tract, constant distention and discomfort is not. Here are 10 tips to help reduce bloating and support healthy digestion. Please note that if you are experiencing severe bloating and digestive discomfort, please seek some further advice from a health professional as it could be something due to bacterial imbalances, a parasite infection, food intolerances or something else that needs to be treated more professionally. 20mins before your meal. This stimulates hydrochloric acid production in the stomach, needed to break down food. This initiates the digestive process, whereby your mouth starts to water with saliva containing digestive enzymes that also break down food. Eating on the run means we’re eating in the stress state called fight & flight. In this state, blood flow & energy is directed at stress coping mechanisms instead of digestive functions such as releasing digestive enzymes & stimulating muscle contractions to move the food through the digestive tract. This impairs digestion and causes bloating. This mechanically breaks down the food, whilst also producing saliva & digestive enzymes further helping to break down the food. It also takes the pressure off the stomach acids further down the tract. Such as grapefruit, radicchio, fennel, rocket & raw cacao to stimulate bile production. Bile breaks down fats & also removes toxic waste from our body. Jerusalem artichokes, garlic, onions, beetroot, asparagus, bananas, legumes & oats contain prebiotic fibres. These fibres stimulate the growth of the good bacteria living in our gut called probiotics which aid in digestion & nutrient absorption. This can cause bloating and gas due to fermentation so don't be alarmed if you experience these symptoms. Just eat in small quantities as you build up a tolerance. Not all bloating is bad! Such as a good quality all natural probiotic enriched yoghurt, kefir & sauerkraut which contain strains of gut loving good bacteria that help digestion. These fruits contain the enzymes papain & bromelain respectively, which helps break down proteins. Perfect before a protein rich breakfast such as eggs. Such as broccoli, cauliflower, kale, green beans & onions. This breaks down the fibre into a more easily digestible form, causing less digestive upsets. When we stop eating and give our digestive system a break, our body starts to heal and repair itself. Try to avoid mindless snacking and leave at least 3 hours between your meals and 12 hours between breakfast and dinner. Practicing intermittent fasting or time restricted eating (e.g. 16/8 hour for 5:2 fast) has also shown to have very favourable effects on digestion. If you want to learn more, read my introductory guide to intermittent fasting. Inflammation is one of the key drives of disease. Key triggers of inflammation include a poor diet high in processed foods and industrial seed oils, lack of colourful veggies, artificial sweeteners, sugar and environmental pollutants. The anti-inflammatory properties are largely attributed to a class of antioxidants called betalains that helps protect your cells against these inflammatory stressors. Beetroot is a great liver support helping the body to cleanse and eliminate toxins from the body. The antioxidant betaine plays a key role in protecting the liver against damage caused by the toxins. 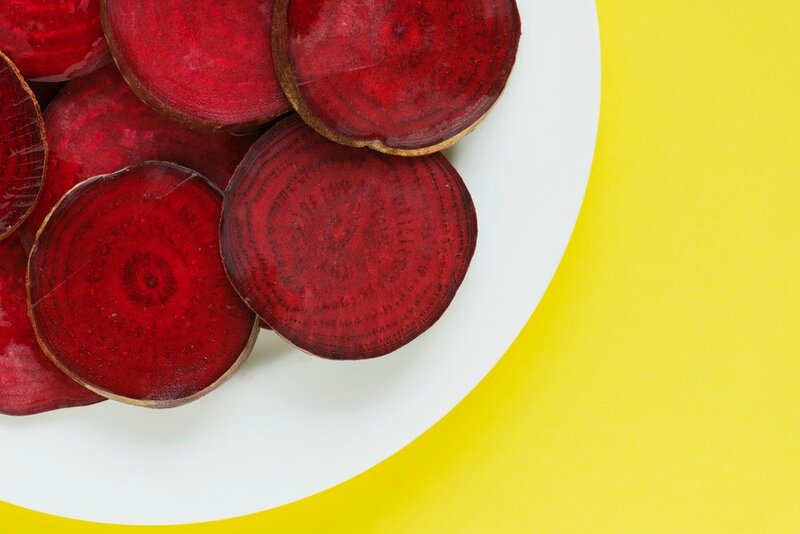 Beetroot also contains the fibre pectin, which aids in the removal of these toxins by binding to them and preventing them from recirculating into the body. Beetroot is a natural source of nitrates which are converted into nitric oxide in the body. Nitric oxide helps to relax and dilate the blood vessels, increasing the flow of blood and thereby reducing the pressure. Just one glass of beetroot juice can reduce systolic blood pressure by an average of 5 points! It's also super effective in boosting your endurance and exercise capacity. Raw Salad: Not many people know that beetroot can be eaten raw and it’s absolutely delicious. Shred it into a salad along with the beet greens (tops of the beetroot), shredded carrot, leafy greens, a sprinkle of chickpeas, seeds, avocado, and drizzle of extra virgin and add some extra protein choice for a healthy balanced and anti-inflammatory meal. Beet Chips: Thinly slice and lightly coat in some extra virgin olive oil or coconut oil and bake in the oven until crispy for a healthy snack option. Enjoy with a delicious dip such as hummus or guac. Beet Juice: Pick up a fresh beet juice at from your closest juice bar or better yet make your own! Boost the nutritional content by adding some greens such as celery, cucumber and mint and a hint of ginger. Avoid adding fruit as this can end up being a high sugar beverage! Beet Protein Balls: A perfect pick me up, especially around that 3pm mark when feeling like you need an afternoon siesta. Add some finely grated raw beetroot or a healthy dose of beetroot powder into your favourite protein ball recipe such as my Cacao Power Balls. Beet Sauerkraut: Sauerkraut is a great way to boost digestive and immune health, by keeping the gut bacteria in a healthy and happy balance. Fermented beetroot is a yummy variation to your traditional cabbage based sauerkraut recipes. There are many ready-made sauerkraut products available on the market that add beetroot or make your own using a mix of beetroot and cabbage. Optimum health is achieved when your body is in a state of balance. When it comes to your mood, having a balanced production of neurotransmitters is essential for a healthy and happy mood. Certain foods play a key role in the production and regulation of neurotransmitters and below are five of my favs. DARK CHOCOLATE: Bet you are happy to see this one made the cut. Chocolate contains a special compound called anandamide which triggers ‘feel good’ feelings by increasing the production of dopamine. To make things even better, dark chocolate also contains other beneficial compounds that slow the breakdown of anandamide therefore prolonging the effects of these ‘feel good’ compounds. Enjoy 1-2 pieces of good quality dark chocolate to treat the taste buds and your mood. The darker the better! GREEN TEA: Green tea contains the amino acid L-theanine which is the the main component responsible for its taste. Whilst this might seem contradictory as green tea can have a stimulating effect from the caffeine, the L-theanine stimulates the production of alpha brain waves, creating a state of deep relaxation and mental alertness similar to that of which is achieved through meditation. L- theanine also increases the neurotransmitter GABA which reduces neural excitation associated with feelings of anxiety. If you experience anxiety, substituting your morning coffee with a green tea can have more favourable effects. FERMENTED FOODS: The gut is referred to as our second brain but in fact the gut sends a lot more information to the brain than the brain sends to your gut. This is because the gut has its own nervous system, involving a complex network of 100 million neurons that are embedded in the gut wall. This nervous system, known as the ‘enteric nervous system’ is largely regulated by the trillions of gut bacteria that reside in our digestive tract. These bugs influence the production of neurotransmitters, serotonin in particular 95% of which is produced in our intestines. A healthy production of serotonin and other mood regulating neurotransmitters requires a healthy balance of gut bacteria. Increasing probiotic rich foods such as kefir, yoghurt (Vaalia), sauerkraut, kimchi, and kombucha help keep the good bugs in check and thus your mood also in check. DARK LEAFY GREENS: This includes spinach, rocket and watercress which are a rich source of folate, an important b-vitamin necessary for the production of mood regulating neurotransmitters. Folate is easily destroyed by heat therefore eating a big green leafy salad for lunch or adding a big handful of baby spinach to your green smoothies is a great way to ensure adequate folate levels in the diet. BLUEBERRIES: Blueberries contain an antioxidant called anthocyanin’s which is responsible for giving them their deep blue colour. This particular antioxidant helps the brain produce dopamine which mediates pleasure in the brain and is particularly important in helping us stay focused. What's in season this winter? When it comes to nutrient content and taste, locality and seasonality of fruit and vegetables is key. This ultimately comes down to where it's sourced from and the time it's taken to get from the farm and onto your plate. Most fruits and vegetables are at their peak when harvested. The longer they are consumed past this point, the more nutrients that are lost and the less flavoursome they become. Produce sourced from overseas means they have longer transit and storage time. Not only does this result in nutrient depletion but the farmers further account for this by harvesting them before they have fully ripened to avoid rotting. Not allowing the produce to fully develop means that they don't reach their full nutrient and antioxidant capacity. Studies have shown that some crops can have up to three times more nutrients when grown in season. Furthermore, eating foods locally produced but out of season means that they aren't being grown in an environment that supports their natural growth. As a consequence, they often require the assistance of genetic modification and chemical additives which are toxic and harmful to your health. To find out what's in season this winter, I asked one of the best in the biz, Chris Antico. Chris and his family have been in the fruit and veggie business for over 70 years. Three generations on and the Antico name remains synonymous with fresh, flavoursome Australian produce. For Chris, quality means flavour and freshness. This often means choosing produce from the smaller growers around NSW and the Sydney Basin area. Another BIG benefit of eating locally and seasonally is that it esnures we are supporting our Aussie farmers and the sustainability of our environment. Here are Chris's top fruit and veggie picks this Winter. Chris services the Eastern Suburbs, North Shore, Northern Beaches and the Inner West delivering hand-prepared boxes of fresh fruit and vegetables straight to the doors of his clients. Order online today and use the code NEWCUSTOMER to receive 15% off your first delivery! Could your gut bacteria be driving your sugar cravings? We are more bacteria than we are cells and thus it’s no surprise that these little bugs play a large role in our health. When in a healthy balanced state, they produce a plethora of products that have strong anti-inflammatory and protective effects. They also hold the key to unlocking beneficial compounds found in food as well as convert the nutrients we eat into their active form. Conversely an overgrowth of the bad bags is associated with diseases such as type 2 diabetes, non-alcoholic fatty liver, autoimmune conditions and obesity. In short, the role they play whether it be positive or negative is largely dependant on the type of bacteria that reside in your gut. One of the biggest effects on the composition of our internal residents is diet. The standard Western diet high in processed foods, sugar and trans fat stimulates the growth of the harmful bacteria and suppress the good bugs throwing this balance out of whack. The Mediterranean Diet high in fruit, vegetables and legumes supports the growth of the beneficial bacteria and keeps our internal environment in a healthy balanced state. What I find to be incredibly interesting is that we have now come to understand that your microbial profile has the power to manipulate your food choices to create an environment in which they can thrive. Therefore, your gut bacteria may also be driving your food cravings and choices; good or bad. The bad bugs thrive off unhealthy foods such as sugar and processed carbohydrates and the good guys thrive off healthy fibre rich and nutrient dense foods such as fruit, vegetables and legumes. What’s even more interesting is they may even have the power to manipulate our food choices by influencing our mood via the production or inhibition of certain neurotransmitters in the gut. Did you know that 80% of serotonin is produced in the gut? A healthy gut is essential for a happy mood. What do you crave when you are feeling a little sad and flat? Ben and Jerry’s cookie dough ice-cream anyone? My take way from this is even when addressing diet, weight loss or my clients food choices, addressing the gut and the microbial balance is also essential. Unless you restore this balance, you might not be able to kick those sugar cravings...and extra kilos. Natural health practitioners and preventive medicine is becoming increasingly popular, with many seeking these types of therapists as their primary healthcare provider. The number of options now available can make it difficult to know which form of therapy is the right one for you. I talked to beautyheaven.com.au about how I practice as a nutritionist and my top 3 principles that forms of foundation of my treatment plans. With an overwhelmingly endless amount of options, doing the weekly food shop has become quite a challenge. What is it that differs one product from the 20 others beside it and more importantly which one is the best option for your health? I shared with news.com.au some of my simple tips to navigate through the plethora of options to help save you time, without compromising your health. The importance of having a healthy balance of bacteria in our gut has become a key topic of health and at the forefront of scientific research. It’s definitely a key area of interest of mine. However, having a healthy balance of bacteria in the mouth is just as important in maintaining good general health, as the mouth acts as a direct portal to other parts of our body. Firstly, our mouth and the gut are intimately connected. This means we are directly feeding these microbes to our gastrointestinal tract, making our gut flora largely influenced by the flora in our mouth. Research has shown that 45% of the microbes in the mouth are the same as the gut. Furthermore, everything that we put into our mouths affects this flora, ultimately influencing not just the composition of bacteria in our gut, but all of our other body systems. Let me explain further. Cavities, plaque and bleeding gums are a sign of disrupted balance to this bacterial flora which is termed dysbiosis. When dysbiosis occurs, there is an overgrowth of ‘bad bacteria’. These bad bacteria start to form colonies called biofilms, where the bacteria start to group together and attach to surfaces such as our teeth. This allows them to them to hide and protect themselves from our immune system and continue to grow. In the mouth, biofilms manifest as plaque build-up. The problem with these biofilms, aside from causing bad breath and an unattractive smile, is that the bacteria start to release acids. This acid causes tooth decay, cavities and inflammation of the gums, known as gingivitis. If left to continue to build up over time, the inflammation and deterioration of the teeth becomes worse leading to periodontal disease. Chronic inflammation and decay means that these communities of bacteria are growing deeper into and away from the mouth, eventually spreading to other parts of the body. This is either via direct access to the blood stream through the gums or down the gastrointestinal tract. A poor diet, medication use, gluten, stress and a number of other lifestyle and dietary factors can cause the gut to become leaky, thus giving these bacteria direct entry into our internal environment. As these bacteria continue to spread through the body, they continue to cause inflammation systemically. Chronic inflammation is the driver of disease. A number of studies have shown that there is a strong association between periodontal disease and chronic diseases such as cardiovascular disease, diabetes, rheumatoid arthritis, osteoporosis, respiratory disease and cancer. The evidence is loud and clear that maintaining good oral health with a focus on achieving a healthy balance of good and bad bacteria is vital in disease prevention. Listed below are my top tips to maintaining a healthy mouth flora and preventing chronic disease conditions. Avoid using antibacterial mouthwash as these not only kill the bad bacteria, but the good bugs, much like the effects of antibiotics on the gut! Drink green tea regularly and give it a good swish around the mouth before gulping down. Green tea contains compounds called polyphenols which prevent the growth of harmful bacteria by changing the pH whilst also reducing and preventing plaque build-up and inflammation. Many studies have shown green tea to be highly effective! Add oil pulling to your morning and night teeth brushing/flossing ritual. This involves putting ½-1 tablespoon of coconut oil in the mouth and swishing it around for about 15-20 minutes whilst getting dressed or ready for bed. Saliva will start drawing into your mouth, whilst toxins are being drawn out. Furthermore, the lauric acid in the coconut oil acts as a potent antimicrobial against the bad bacteria. Chew on lots of plant foods such as green leafy vegies. I suggest 5 handfuls of vegies a day. This feeds the beneficial bacteria, allowing them to thrive so they aren’t out numbered by the bad bugs. Avoid refined sugars such as lollies, soft drinks and commercial condiments like tomato and BBQ sauce. The sugar not only feed the bad bacteria but it also increases the acidity of the mouth, further creating a desirable environment for the bad bacteria to grow. Ensure you have a healthy saliva flow. Saliva plays a number of key rolls in maintaining oral health such as diluting and eliminating sugars, buffers the acidity and has antimicrobial action. The oral microbiome diversity and its relation to human diseases. As the temperature drops, maintaining a healthy body weight can become difficult due to interrupted workouts, comfort food cravings and more nights in tempting us to overeat. Here are 5 of my top tips to staying on track and maintaining a healthy body weight during the winter months. Without the hot and humid weather, we can easily forget to drink water and stay hydrated. Dehydration however can easily be mistaken for hunger, causing us to eat when all our body needs is some fluid. Keep a jug of water on your desk or carry a water bottle around to help remind your to you drink at least 2L a day. There are also some great free mobile apps that alert you when it’s time to drink up. Try ‘Water Alert’ for iPhone or ‘Water Your Body’ for Android. We can easily convince ourselves that it’s too cold to exercise. The truth is there are lots of great indoor workouts you can do that don’t require a gym membership and will keep you out from the cold and in shape. If you like training with a group find a local hot yoga, pilates or spin class, many places offer no contract drop-in classes. If you don’t want to leave the house, download a workout app (I like Yoga Studio) or invest in a skipping rope, which will get your heartbeat pumping without breaking the bank. Naturally our appetite can increase when we are cold as our body uses more energy (kilojoules) to keep us warm. Having healthy snacks prepared when hunger strikes will ensure you avoid those high sugar/high trans fat foods which are often all that is available when out and about. Try my Cacao Power Balls or Coconut Caramel Balls for an easy, nutritious and delicious pick me up. In an attempt to stay warm, our winter attire tends to become fluffy and oversized. Whilst this might be incredibly comfy, it also means those extra kilos can easily go unnoticed. Wearing your skinny jeans regularly is a great way to keep you conscious of your weight and avoid the muffin tops from sneaking in…or hanging out. Post dinner snacking is a key cause of weight gain, as our metabolism starts to slow down, allowing our bodies to rest and heal whilst we sleep. Brushing your teeth after dinner can help to resist the urge to snack. Above all, don’t place too much pressure on yourself. The more you obsess over your weight or deprive yourself of certain foods, the more top of mind it will be and the more you will want it. We always want what we can’t have. Know your limits, enjoy everything in moderation and stay warm!